The joints and muscles in your wrists are far from the strongest. The repetitive strain resulting from weightlifting increases the chances of significant injury to your wrists that could prevent you from being able to perform. Aside from shoring up your technique, wrist wraps are among the best tools you can use to ensure an injury-free workout. But, there are lots of different weight lifting wrist wraps on the market, and they’re not all created equal. Knowing what pair is right for you isn’t necessarily clear cut. 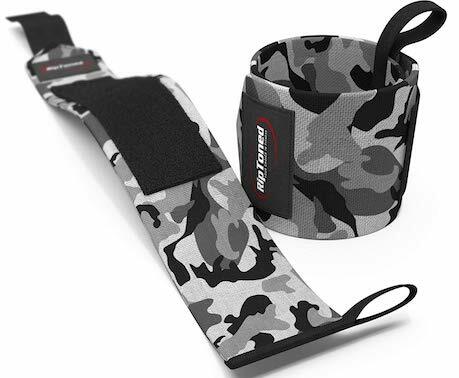 Moreover, weightlifting wrist wraps are appropriate for use in certain circumstances and not in others, and you may be wondering if you should even be using wrist wraps. 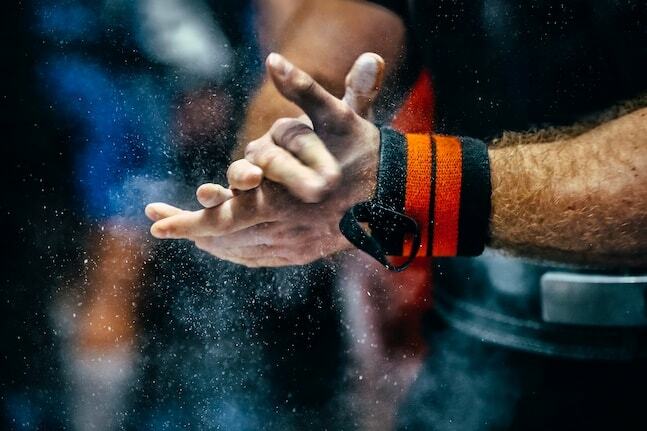 In this article we’ll take a look at the best weightlifting wrist wraps currently on the market, and provide some guidance on whether you should actually get a pair. Should You Get Wrist Wraps? Your wrist joints are vulnerable. The right pair of wraps will decrease wear and tear on the joints and increase performance by preventing hyperextension. By decreasing mobility, the risk of you moving your joints too far is eliminated. Here are six of the best weightlifting wrist wraps you can pick up right now. Rogue Wrist Wraps are constructed from a combination of cotton, elastic and polyester that prevents irritation and absorbs sweat. These materials are adorned in a variety of colors and each pair is fitted with a thumb loop that ensures a more secure fit. They’re available in 12″, 18″ and 24″ sizes and feature a 3″ width. Smaller wraps will provide support without compromising on mobility, whereas the largest option is suited more towards powerlifting and Strongman training, where maximum support is essential. 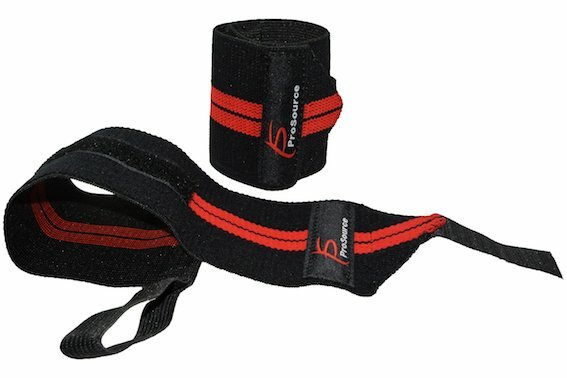 Coming in at number two on the list is the ProSource Weight Lifting Wrist Wrap. These feature not only a thumb loop, but a velcro strip along the material for a snug and slip-free fit. The cotton, elastic and nylon blend is both comfortable and supportive. Unlike some other entries in this list, these come in a one-size fits all style thanks to the adjustable velcro strap. They’re ideal for not only weightlifting, but CrossFit, yoga and any other wrist-intensive exercise as well. The 12″ length provides a fair balance between mobility and support, with an emphasis on mobility. 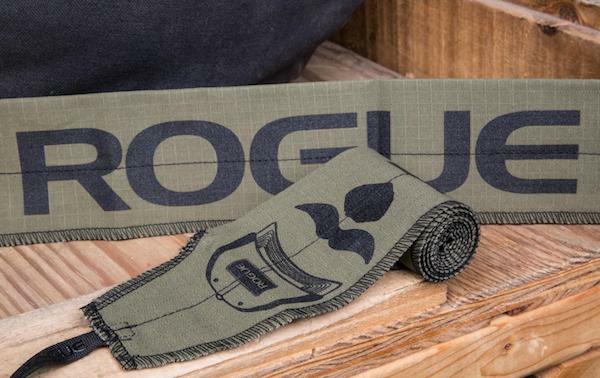 Rogue Fitness’ wrist wraps are so good that we just had to include their other offering in the list as well. As the name would suggest, the Lightweight Wraps are geared more towards lifters who are looking for support without adding too much bulk to their wrists. These 35″ wraps are made in the US and feature a “twist-tight” design that allows you to quickly adjust the material to your liking. This means you can switch to a more flexible fit for lighter weights and then tighten them up for heavier lifts without having to constantly remove and re-adjust the straps. These wraps feature a unique, patented suede and leather construction that’s built with longevity in mind. Adjustable velcro straps and a thumb loop are standard for the best fit. 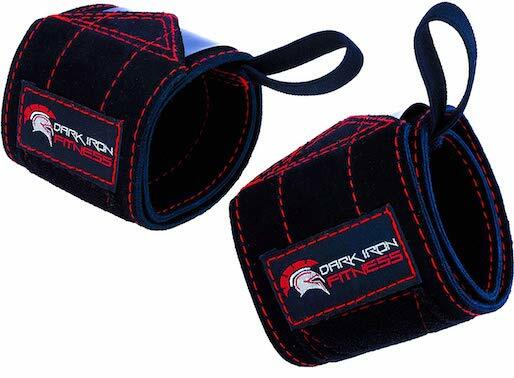 Dark Iron Fitness coins the velcro as “high endurance” and is said to last much longer than standard straps. The Leather Weight Lifting Wraps are 22″ in length and feature a thicker, stiffer construction. This means they’re geared more towards heavy lifting where mobility isn’t the top priority. The best part about these wraps is probably the fact that Dark Iron Fitness offers a lifetime guarantee, with a free replacement if yours ever fail. 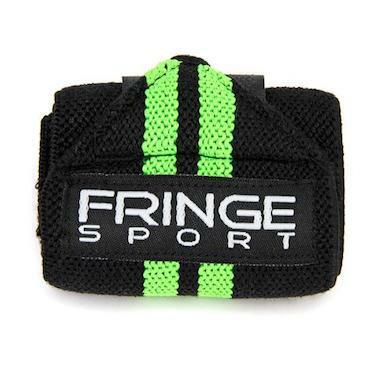 Fringe Sport’s wrist wraps come in both 13″ and 16″ lengths. The former is more suitable for general lifting due to the more flexible construction, whereas the 16″ wrap is geared towards powerlifting and Strongman athletes. A standard thumb loop and velcro closure is included for maximum support. Cotton, elastic and polyester is the material blend of choice. This provides an ideal balance of flexibility and strength that helps prevent injury and wrist pain. The clean, modern design is available in a variety of colors and each pair comes with a one year guarantee. These versatile wrist wraps are suitable for a plethora of disciplines, including powerlifting, yoga, CrossFit, MMA, strength training and bodyweight workouts such as push-ups and planks. 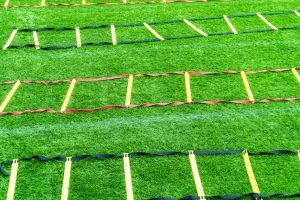 They’re classed as heavy duty and are 18″ in length, making them more suitable for heavy lifting than more mobility-demanding workouts. Luckily, they’re available in both “stiff” and “less stiff” options. The latter would strike a better balance for those looking to still maintain a decent level of flexibility. A unique camo design and thumb loops come standard, along with velcro straps for an adjustable fit. Should You Use Wrist Wraps? Whether you need wrist wraps or not depends on the current state of your wrists and your weightlifting proficiency. The reality is that wraps artificially restrict the mobility or flexibility of your wrists. For this reason, some argue that constantly using wrist wraps when your wrists are healthy, especially with sub-maximal movements, can cause imbalances that increase your risk of injury and stunt muscle development. For this reason, wrist wraps are ideal if you’re recovering from an injury but need / want to continue training. By limiting your joints’ range of motion, there’s less risk of further injury or pain. Alternatively, some people have naturally loose or weak wrist joints that are prone to overuse injuries. If you’re one of those people, then an ounce of prevention is worth a pound of cure, so adding a pair of wrist wraps to your gym bag may just be a good idea. 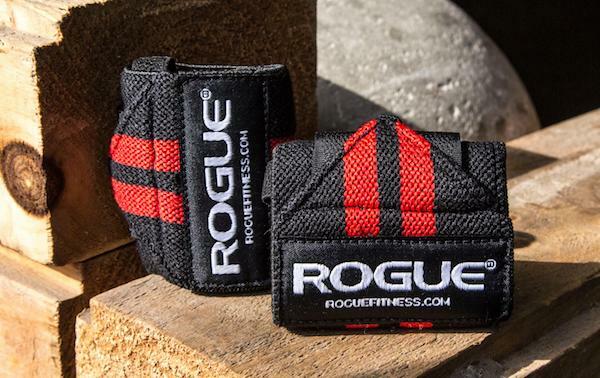 Well, there you have it: The best weightlifting wrist wraps currently available. If you’re in need of some support for your wrists when training, then you’ll be able to find a great pair of wraps in the list above. Simply filling your bag with a bunch of expensive products and heading to the gym may be the easy way in, but it isn’t the right way. 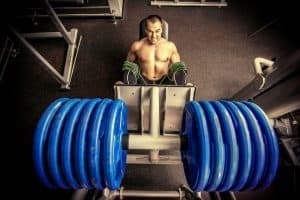 While gear such as trainers, gadgets and wrist wraps go a long way in improving your weightlifting sessions, they don’t do much for your technique – which is by far the most important aspect of your workout. 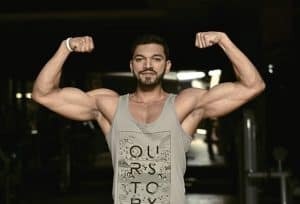 Focus on getting your technique down and building a routine that prevents injury and promotes healthy development of your muscles. This way you’ll be saving money in the long run. However, that’s not to say a few pieces of gear such as wrist wraps aren’t worth considering. They may just be that extra kick you need to get into the gym and start working towards your goals. Just ensure that they are truly necessary for you and that you’re using them correctly. Today’s medical bills are simply far too high to go any other way.